ECB President Mario Draghi has said the initial plan to make small savers pay for the Cyprus bailout was “not smart”. Mario Draghi said a proposal to make “insured depositors” pay did not come from the European Central Bank, the European Commission or the IMF. He said the proposal only arose in talks with the Cypriot authorities, and was “swiftly corrected”. 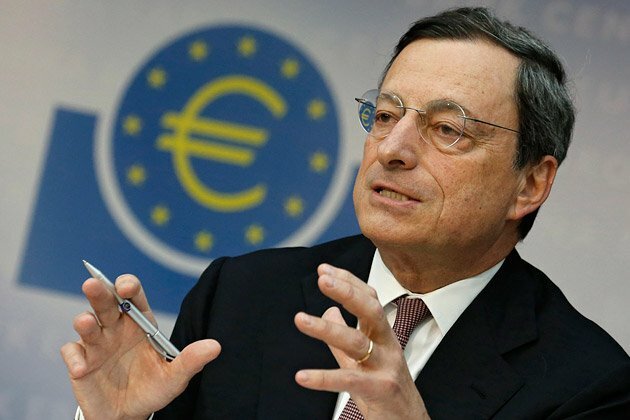 Mario Draghi was speaking after the ECB held eurozone interest rates at 0.75% again. It was the ninth month in a row that the interest rates had been kept unchanged, but Mario Draghi indicated that the ECB was ready to act, if necessary. He also suggested that the problems seen for some time in smaller, weaker economies such as Spain, were spreading to stronger economies. Cyprus eventually agreed a 10 billion-euro ($12.8 billion) international bailout, which will see depositors with more than 100,000 euros lose some of their savings. Accounts which have less than 100,000 euros in them will not be affected, but would have been under the original bailout proposals. Speaking about the bailout, Mario Draghi said that the initial plan to impose a levy on all depositors “was not smart to say the least”. He said the ECB did not envisage savers covered by a guarantee – that is, those with up to 100,000 euros in savings – being forced to contribute towards the country’s rescue plan. “You have a pecking order, and here the insured depositors should be the very last category to be touched,” he said. Mario Draghi also told a news conference that the Cyprus bailout was not a blueprint for what would happen in further bailouts. “Cyprus is no template,” he said. Mario Draghi was asked whether it would have been better for Cyprus to leave the euro. “What was wrong with Cyprus’s economy doesn’t stop being wrong if they are outside the euro,” he said. Leaving the euro would entail a big risk for Cyprus, and that an exit from the currency could find the country having to pursue reforms “in a much more difficult environment”, he added. Mario Draghi also said that the recent crisis in Cyprus had “reinforced the Governing Council’s determination to support the euro”. Despite continuing signs of economic weakness across the eurozone, the ECB president said rates were on hold “for the time being” by consensus. He said he expected to see a gradual economic recovery in the second part of 2013. However, Mario draghi said that growth was “subject to downside risks”. Risks included slow implementation of structural reforms by governments, or weak domestic demand. “These factors have the potential to dampen the improvement in confidence and thereby delay the recovery,” he added. After his comments the euro fell to its lowest level in more than four months against the dollar, to $1.2745 – the weakest since mid-November – before recovering its losses. However, Mario Draghi said that inflation would be contained in the medium term, but the bank would act if necessary. “Our monetary policy stance will remain accommodative for as long as needed,” he said. The latest indication of the state of the eurozone economy came on Thursday from financial information service Markit, which said the region’s economic contraction had worsened last month. Its closely-watched composite purchasing managers’ index (PMI), which tracks both the services and manufacturing sectors, also suggested that the German economy slowed to “near stagnation” last month, while France’s recorded its biggest contraction for four years.